January 9th is a milestone date in my life. My experiences from January 9, 1964 have etched into my mind a life lesson that I carry to this day. Eight years ago, on January 9, 2008, I shared it from one perspective. Today I want to share it from another. As the lesson starts from the same place, my story about it starts the same way. The perspectives, however, are very different. Sometimes images from a life-altering event can remain fresh even after 53 years. For me every January 9th brings back images from 1964, when I was a 6th grader living in Panama. That was when I saw the effects of my first political experience explode into the world news and leave 25 dead and many more injured. I was purely a bit player – a crowd extra – in what led up to that day. The fact that I was only 11 years old at the time provided an element of farce to what transpired. One thing I learned from then was how quickly mindless fun and frivolity can turn to tragedy and fear. Detailed historical accounts of the events of January 9th, 1964 – Martyrs’ Day, as it’s known in Panama – are readily available here, here and here. In 1963 President Kennedy ordered that all American flags in the Canal Zone be accompanied by Panamanian flags, to acknowledge Panamanian sovereignty over the Canal Zone. This order wasn’t popular with many Americans living in the Zone, who mistakenly felt it was really kind of an American colony. After President Kennedy’s death, the Governor of the Canal Zone decreed that as of January 1st, 1964, American flags would not be flown over schools, post offices, cemeteries, etc., to avoid the aggravation of flying Panamanian flags there as well. It would turn out the Zonians weren’t happy with that order either. Shortly after we returned to school from Christmas break that year, I became aware of a growing restiveness among the Zonians: they were unhappy about the absence of the American flags from the usual places. The first demonstrations took place at Balboa High School, clearly visible a few hundred yards across a green from my elementary school. Along with the one on the flag pole, there were soon numerous American flags attached to parts of the school, waving in the tropical breezes. The sentiment quickly spread and demonstrations broke out around the Canal Zone. One such demonstration took place at Ancon elementary school, the other elementary school on the Pacific side of the Zone. Bizarrely, it was reported the students there occupied the administration office (remember, these were elementary school kids), took a flag and ran it up the school flag pole. At Balboa elementary school, we weren’t quite that brazen. Or maybe the adults in charge were a little more…adult. But we did have lunchtime demonstrations, running up and down the playground waving flags that had magically arrived for us. (Actually, one of the suppliers was a Panamanian classmate named Ramon, who was a natural leader/instigator.) It was all very exciting and fun. So much fun, in fact, that after school we waved our American flags out of the windows of our school bus as we rode through the streets of Panama City to our homes. Looking back, that was a clearly dumb and provocative thing to do. But what did we know? We were just kids caught up in the moment. On the evening of January 9th, things came to a head. Panamanian students marched to Balboa High School, where they wanted to symbolically raise their flag and then take it back down and leave. Americans surrounding the flag pole resisted, a scuffle broke out, and the rest – as they say – is history. As I recall, the next morning my dad drove over to the border near Ancon to check out the destruction from the night before. One of the things he saw, which he later photographed, was at the burned out Pan-American building – apparently destroyed because it had “American” in its name. (The building was owned by a Panamanian.) 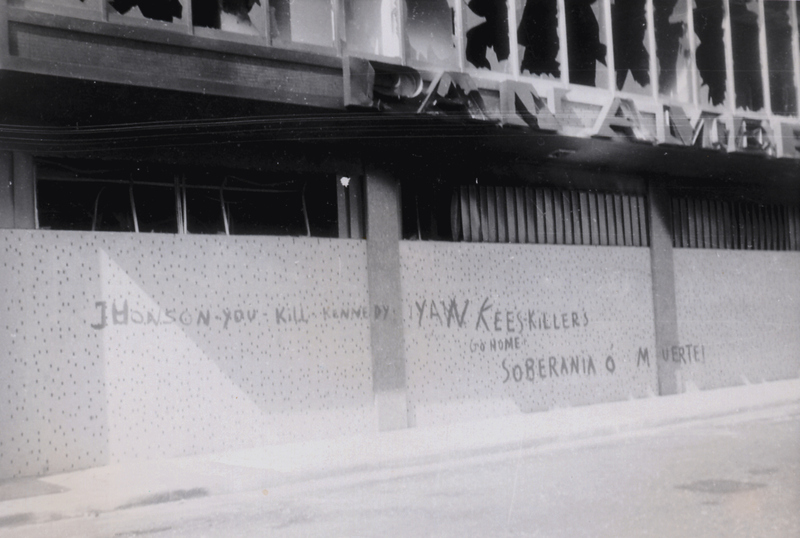 On the side of the building someone had written in red paint “Johnson-you-kill-Kennedy Yankees Killers Go home Soberania O’ Muerte!” (“Sovereignty or Death!”) It was an interesting statement – Haiku-like – revealing an anger at Americans combined with a hinted sense of loss for the recently killed Kennedy. (Only 7 weeks before, Panamanians had widely mourned Kennedy’s death.) It also reflected a certain Panamanian sense of how leadership succession might take place. There was little else to do, as there weren’t computers, iPods, video games, etc. back then, and the news was frightening. So my family spent countless hours playing Rummy Royal, a board game my mom had gotten us for Christmas. Looking back, it was a peculiar time of crushing boredom and very real fear. It was awful. After the riots ended, we never wanted to look at that Rummy Royal game again. History will show that the events of that weekend eventually led to the renegotiation of the Panama Canal treaty and the returning of the canal to Panama. The Zonian belief that they could preserve their illusory American colony from “foreign” interlopers blew up in their faces, eliminating their “homeland” instead. The events of that time shaped me in a number of ways. How I – all of us, really – had gotten mindlessly swept away in the feelings of the crowd made me very leery of large group activities. Years later, when I attended the occasional anti-Vietnam war demonstration, I was always on my guard to avoid getting swept away into any kind of mob action. In retrospect, the events of January 1964 gave me my first awareness of the way individual and group behaviors can be intertwined. When Barack Obama became President in 2009, it was a time of great hope for many. As the first African American President of the United States, his achievement appeared to signal a new era. It seemed to indicate that we as a country had risen above the racism and division that had stained our nation’s history from its earliest days. It also offered the hope that we might also get beyond other divisions and prejudices that had plagued us for so long. But from the start in 2009 it became apparent that not everyone shared that hope and enthusiasm for such change. Over the last eight years our country’s divisions appear to have gotten deeper and wider; the passion of those opposed to this change became greater and greater. There have been a variety of causes attributed to this division and passion. Some feel it’s rooted in the economic upheaval the country (along with the rest of the world) has experienced. Others argue that it’s a reflection of the biases of those opposed to change: their inherent racism, misogyny, nativism, homophobia, etc. Whereas certain individuals and certain cultures find adapting to change relatively easy, many others, for various reasons, do not. Their resistance, which may seem revolutionary because it tends so often to focus on overthrowing the new social orthodoxy, is in fact no more than an effort to forestall or at least postpone dealing with the changes taking place around them. One trait that many Zonians in the 60s and many Trump supporters today share is a willful disregard of the facts. Many Zonians apparently believed the Canal Zone really was American property, even though a reading of the Hay-Bunau-Varilla Treaty would make clear the land was leased from Panama. And many Trump operatives and supporters share a lack of interest and concern about objective facts. Beyond the question of basic facts – or possibly in connection with it – there is also the matter of “mob mentality.” At times a group can get so worked up that people lose themselves in activities that grow increasingly unreasonable – and potentially violent. I saw this in 1964, when we started demonstrating over the flag. At first it just seemed exciting and fun. But as time went on the energy and excitement of the group built to a crescendo that vitiated reason and self-control. We lost sight of anything besides the fact that we were all united in waving flags. In short order things started happening that in retrospect seem crazy – like a group of elementary-school kids taking over an administration office. A sad fact of mob mentality is that often it takes an event of shocking violence to bring people to their senses. The riots and death that broke out on January 9, 1964 finally broke the spell. After the riots were over the fever of excitement was gone. Aside from expressions of surprise and shock about events, nobody wanted to dwell on what had happened. It was like waking up after a night of wild drinking: we wanted to just forget about the whole thing. Shortly afterwards, American flags returned to Canal Zone buildings – accompanied (without objection) by Panamanian flags. Unfortunately for groups unhinged from reality – and for those affected by their actions – reality has a way of eventually making itself known. For the Zonians, reality came in the shape of a renegotiated treaty that abolished the Canal Zone. It is not yet clear how reality will assert itself during a Trump administration. But those who reside in the “reality-based community” understand that sooner or later it will. The troubling question is: how will we as a country and society return to reality? Will Trump supporters become disillusioned when they realize we won’t return to the 50s; that the rich will continue to get richer while the middle class and the poor drop further behind? Will they be shaken by increasingly weird weather events to realize climate change is real? Will they eventually realize that Trump is simply not fit for the role of President of the United States? Or will something else bring them to their senses? Or will it take an event of shocking violence – as some of us experienced in Panama in January 1964? Will another war of choice bring disillusionment, as the Iraq war eventually turned people away from George W. Bush? Could it be a shocking collapse of the economy, as we experienced in 2008? Or could it be something even worse? Or…perhaps we can begin to turn things around by asking what, exactly, makes America great. Many may feel America’s greatness is tied to it’s wealth and economy. But other countries have been wealthy. Many may feel our greatness is tied to our military might. But other countries have had powerful militaries which ruled the world. In either case, that wealth or power didn’t last. Sooner or later the wealth was lost and the power faded. In this emphasis on wealth and power we are also faced with the fact that America only became truly wealthy and powerful – compared to the rest of the world – after the Second World War. Does that mean America was not great for most of its history? If we believe America is indeed great, we need to recognize that it’s not because of our wealth and power. Such things inevitably ebb and flow. And America is not great because we can wave our flag in the face of other nations. Such actions only bring resentment and hatred. America is great because of our ideals – as represented by our Constitution and Bill of Rights. America is great because even when our leadership differs tremendously on what course our country should take, the succession between leaders takes place through ballots instead of bullets. America is great because, thanks to the flexibility and rebirth enabled by our democratic institutions, we have been able to continually face troubling times and adapt to them, coming out stronger in the end. America is great because at our best, like President Kennedy, we sometimes inspire others with genuine hope and idealism. When we are at our best, many others around the world see us as truly a sweet land of liberty. Sometimes, a seed of admiration for our idealism shows up in the most unlikely of places – like an angry message painted on the wall of a burned out building. It’s the peculiar fate of America that even with our military might and wealth, we are not geared to lead the world through coercion. We’re not good at it and, deep down, the idea of empire makes us uncomfortable. Perhaps due to our rebellious origin, it’s not in our national DNA. …such movements rarely enjoy long-range success. They result from an opposition of the needs of the emerging social structure with those of the existing group culture…and when such incongruity is not resolved by effective integration of the two competing elements, it has historically been the almost inevitable fate of the traditional culture to give way to the needs of the ongoing social structure. # It is of much lower resolution than the original. Copies made from it will be of very inferior quality. # The photo is only being used for informational purposes. # Its inclusion in the article adds significantly to the article because the photo and its historical significance are the object of discussion in the article. I've been interested in current events since at least the mid 1960's, and in ideas from modern science since the early 1990's. My website Quantum Age, which has been online since 1996, presents a basic framework for applying ideas from modern science to today's world. In this blog I discuss current events in the context of that framework. This entry was posted in energy/flow, signs of the times and tagged change, Obama, politics, Trump. Bookmark the permalink.